Of the infamous Star Wars prequel trilogy, George Lucas has often said that the three movies were like poetry, each film rhyming with its equivalent in the original trilogy. With all due respect to Mr. Lucas (who seems a thoroughly decent fellow), the claims to cinematic rhyme fit better on The Force Awakens than the trilogy he wrote and directed. The Force Awakens opens with important information being placed with in a runaway droid and climaxes with an attack on a terrible, planet-destroying weapon, but the characters that embark on this journey and the means to getting there are fresh and engaging. And perhaps most important to the franchise, they’re exciting. The plot: It’s 30 years since the destruction of the second Death Star and the fall of the empire, and from its ashes has risen the insurgent military faction The First Order, guided by the shadowy Supreme Leader Snoke (Andy Serkis) and commanded by General Hux (Domhall Gleeson) and the fanatical Kylo Ren (Adam Driver). 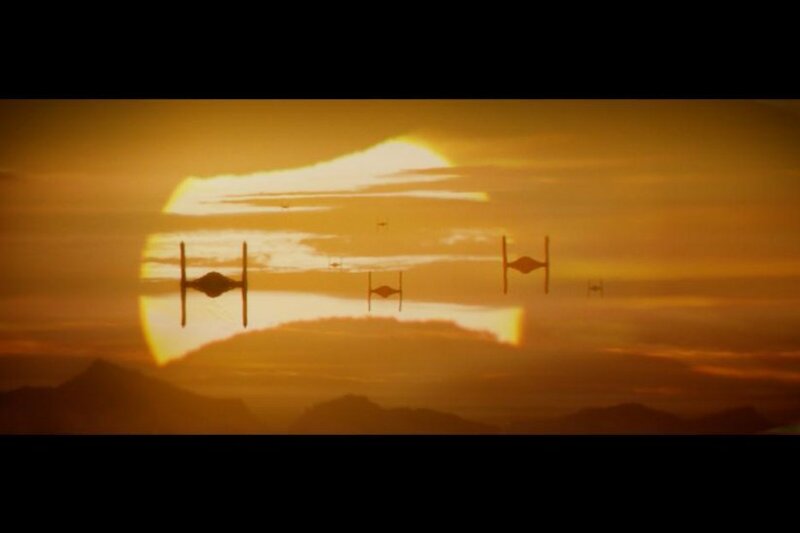 General Leia Organa (Carrie Fisher), leading the Republic’s military force The Resistance, sends top Resistance pilot Poe Dameron (Oscar Isaac) to the planet Jakku to recover a map leading to the last known whereabouts of her brother, the missing Jedi master Luke Skywalker (Mark Hamill). Though Poe is captured by The First Order during his mission, he manages to store the map in his droid BB-8, who is soon found by the mysterious, force-sensitive scavenger Rey (Daisy Ridley). 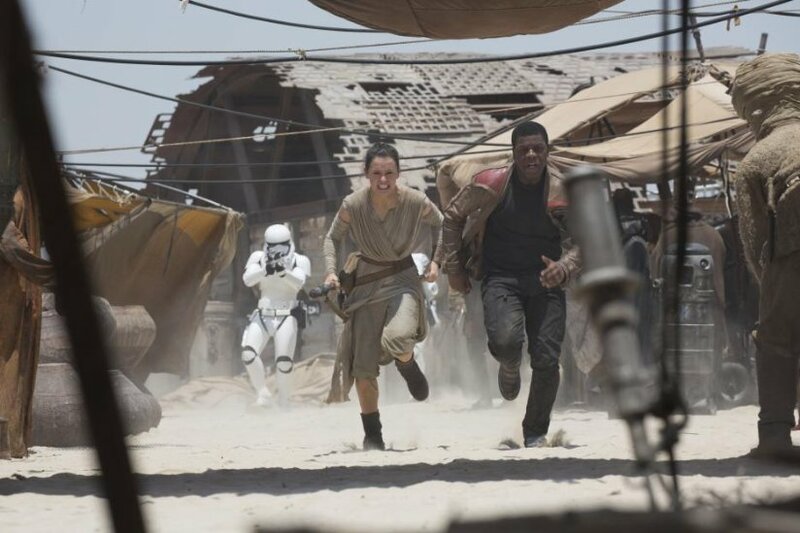 Aiding in Poe’s escape in an attempt to desert The First Order, reluctant stormtrooper FN-2187/ Finn (John Boyega) crash lands on Jakku and soon joins Rey’s quest to return BB-8 to the Resistance, a quest that soon puts them in the path of the aging, legendary smuggler and Rebel Alliance hero Han Solo (Harrison Ford). Star Wars has endured for the better part of half a century on the strength of its characters, and happily, The Force Awakens continues this legacy. In the original trilogy, there’s a warmth and sense of camaraderie between the three leads that carries throughout each movie and endears them to the viewer from the start, and the same is true of Rey and Finn. Lawrence Kasdan’s script (with Michael Arndt, to some unclear degree) and J.J. Abrams’ direction builds their friendship effortlessly –the duo’s flee from Jakku has some of my favorite non-verbal character development I’ve seen all year– but their rapport extends beyond what’s on the page or how a scene is shot; they simply feel believable as friends. I don’t want to spend too much of this review disparaging the prequels to make my points about The Force Awakens, but compare the organic banter between Rey and Finn with the interactions between almost any major characters in the prequels and you’ll understand why this relationship is so special, and so especially Star Wars. Oscar Isaac elevates a character that should have been one-dimensional into a highlight of the movie solely though his charm and wit. Kylo Ren, *spoilers* revealed as the son of Han and Leia *end spoilers* may end up being the most compelling character or the new trilogy. More visibly torn between Dark Side fanaticism and his better instincts than Darth Vader, his role positions him as a sort of Luke Skywalker through the looking glass. At the end of the movie, I was anxious to learn what’s next for these characters and was upset I’d have to wait another two years to find out. If that’s not in the spirit of the original trilogy, I don’t know what is. Our returning heroes do so unevenly. The legendary and legendarily curmudgeonly Harrison Ford feels committed to recapturing the spirit of Han Solo and does so to great effect. The smirk, the wit, and that guarded tenderness that made the character the movie role model dudes (and ladies) who want to walk a little taller are intact, and seeing Ford inhabit the role again is genuinely exciting. Carrie Fisher’s return to Leia feels comparatively stilted and wooden, a fact I am willing to chalk up to an unexciting role. 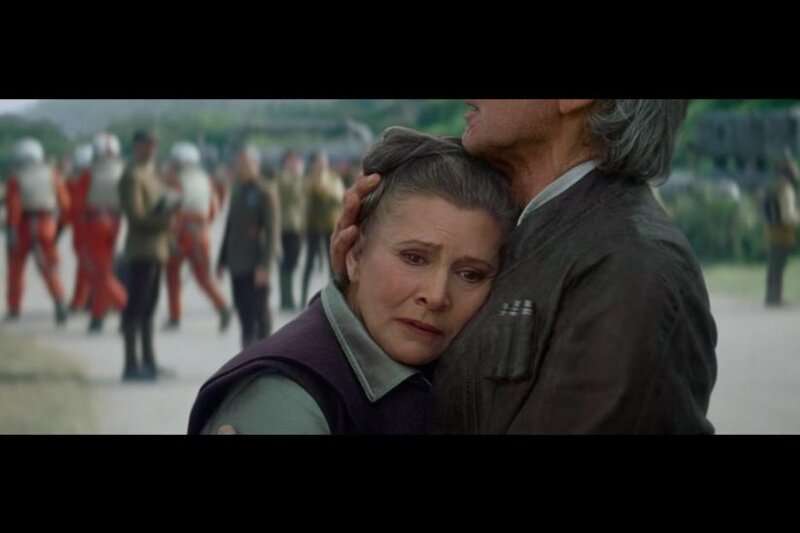 While Han gets to be in his space-scoundrel element, Leia is relegated to being Important and dignified in Resistance HQ, with little room for the sarcasm or take-charge nature of the original trilogy. The stage is set for her to become a larger player in the following movies, but her role feels bare here. *Sort-of spoiler* In what little we see of Luke, Mark Hamill does a great job of wordlessly portraying the inner gatefold of Led Zeppelin IV. *End sort-of spoiler* The original crew have their roles to play in this trilogy, but you might have to wait a few years longer to find out what some of those roles are. You know who would have been great? Billy Dee Williams as that lovable rogue Lando. Early criticism of The Force Awakens seems to center around the familiarity of the plot. 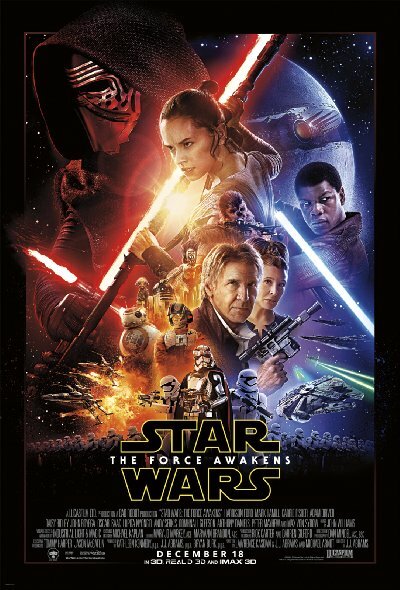 The Force Awakens hits many similar narrative and emotional beats as A New Hope, but most of these serve to highlight the differences between the original cast and this new generation, as each face similar trials to the heroes of the Rebel Alliance, but frequently react to them in different and in altogether human ways. The plot is weakest not when it’s most familiar, but when it’s at its easiest. Some of the decision made in the film are made to transparently move characters from one location to the next or leave important questions unanswered, and, in addition to his many established abilities, R2D2 also now functions as rather too convenient plot device. There’s a light side of fan callbacks and references and a dark side, and so far the new trilogy remains for the most part on that light side. Abrams’ direction makes the 135 minute runtime feel significantly less, and keeps the pace at a clip with only a few hiccups along the way. The result is a movie that’s breezy and satisfying, but ultimately lighter than one might expect. To paraphrase friend of the blog Ted Blewett, if you’re expecting a steak, be prepared to be served good tapas instead. It’s hard to say whether The Force Awakens lived up to its astronomical hype, and as I’ve written before, perhaps it doesn’t really matter. The Force Awakens is a fun and exciting space opera with compelling characters, and a gripping opening to a new trilogy. It’s uneven at times and in true Abrams fashion, may leave you with more questions than answers; but you can guarantee I’ll be there opening night to get those answers from Episode VIII. Before Star Wars was global phenomenon and a pop culture monolith, it was an exciting adventure, and that’s exactly what The Force Awakens is too. Second Breakfast: What Are You Doing With Your Life?